This article is about the fable of Aesop. For the song by The Style Council, see Boy Who Cried Wolf (song). For album by Passenger, see The Boy Who Cried Wolf (album). For song by futures, see The Holiday (album). For the film segment in a Chinese short film, see Crossed Lines (film). Not to be confused with Cry Wolf, Boy Cried Wolf, or The Boy Who Cried Werewolf. The Boy Who Cried Wolf is one of Aesop's Fables, numbered 210 in the Perry Index. From it is derived the English idiom "to cry wolf", defined as "to give a false alarm" in Brewer's Dictionary of Phrase and Fable and glossed by the Oxford English Dictionary as meaning to make false claims, with the result that subsequent true claims are disbelieved. The tale concerns a shepherd boy who repeatedly tricks nearby villagers into thinking wolves are attacking his flock. When a wolf actually does appear and the boy again calls for help, the villagers believe that it is another false alarm and the sheep are eaten by the wolf. In later English-language poetic versions of the fable, the wolf also eats the boy. This happens in Fables for Five Year Olds (1830) by John Hookham Frere, in William Ellery Leonard's Aesop & Hyssop (1912), and in his interpretation of Aesop's Fables (1965) by Louis Untermeyer. The moral stated at the end of the Greek version is, "this shows how liars are rewarded: even if they tell the truth, no one believes them". It echoes a statement attributed to Aristotle by Diogenes Laërtius in his The Lives and Opinions of Eminent Philosophers, in which the sage was asked what those who tell lies gain by it and he answered "that when they speak truth they are not believed". William Caxton similarly closes his version with the remark that "men bileve not lyghtly hym whiche is knowen for a lyer". The story dates from Classical times, but, since it was recorded only in Greek and not translated into Latin until the 15th century, it only began to gain currency after it appeared in Heinrich Steinhöwel's collection of the fables and so spread through the rest of Europe. For this reason, there was no agreed title for the story. Caxton titles it "Of the child whiche kepte the sheep" (1484), Hieronymus Osius "The boy who lied" ("De mendace puero", 1574), Francis Barlow "Of the herd boy and the farmers" ("De pastoris puero et agricolis", 1687), Roger L'Estrange "A boy and false alarms" (1692), and George Fyler Townsend "The shepherd boy and the wolf" (1867). It was under the final title that Edward Hughes set it as the first of ten "Songs from Aesop's fables" for children's voices and piano, in a poetic version by Peter Westmore (1965). 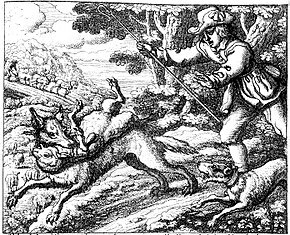 Teachers have used the fable as a cautionary tale about telling the truth, but an educational experiment in the first decade of the 21st century suggested that reading "The Boy Who Cried Wolf" increased children's likelihood of lying. On the other hand, reading a book on George Washington and the cherry tree decreased this likelihood dramatically. The suggestibility and favourable outcome of the behaviour described, therefore, seems the key to moral instruction of the young. However, when dealing with the moral behaviour of adults, Samuel Croxall asks, referencing political alarmism, "when we are alarmed with imaginary dangers in respect of the public, till the cry grows quite stale and threadbare, how can it be expected we should know when to guard ourselves against real ones?" ^ "wolf". Compact Oxford English Dictionary. askoxford.com. OUP. June 2005. Retrieved 19 September 2007. ^ Fable 5, "Of the boy and the wolf"
^ "The Shepherd-boy and the Wolf"
^ "The boy and the wolf"
^ Po Bronson and Ashley Merriman, New York 2009. Nurture Shock – New Thinking about Children. pp. 83–84. ISBN 978-0-446-50412-6. This page was last edited on 11 April 2019, at 20:44 (UTC).